The Ambassador to Ireland has described the article about a Polish woman living on the dole in Donegal as inaccurate, selective and subjective. THE POLISH AMBASSADOR to Ireland has responded strongly to an article in an Irish newspaper which purported to give an account of a Polish woman’s life on the dole in Donegal. Marcin Nawrot criticised the piece in today’s Irish Independent for its inaccuracy and said that it was ‘subjective and selective’ in how it presented the story. The article purported to be about an account given by ‘Magda’ to a Polish newspaper about the benefits she enjoyed from the social welfare system. However in a letter to the News Editor of the paper, Ambassador Nawrot said there were a number of inaccuracies in the Irish Independent piece which could have been avoided through a proper translation or a more objective approach. “In terms of her describing her life as “Hawaiian Massage”, at no stage in this article does she make such a statement,” writes the Ambassador. “What she actually says is that she has completed a FÁS course in Hawaiian Massage and that she’s planning to open a massage business next year. I think you can agree that this misrepresentation completely changes the tone of the article”. He says that there were “many other inaccuracies… throughout the Irish Independent article which could have been easily avoided if only the Polish article had been translated correctly or its content presented in a more objective manner”. The Ambassador cites the contribution of many Polish people to Irish society in recent years. “The decision to remain in Ireland that so many Polish people made in the recent years is a decision to make a valuable contribution to the Irish state by living and working here, integrating with the Irish society and being a part of it all in good times and bad,” he wrote. “It’s impossible to imagine that this decision, sometimes a very painful one, is made on the basis of the unemployment benefit or other kinds of support granted to the jobless by the Irish State”. I refer to the article “Welcome to ’good life’ on welfare – how Polish waitress embraced La Dole-ce Vita” published in the Irish Independent of Feb 1. Firstly, let me focus on the article itself and on its level of inaccuracy relative to the original article (published in the magazine Wysokie Obcasy to the Polish daily Gazeta Wyborcza of Jan 29). I wish to stress that the authors of the Irish article use the facts presented in the Polish article in a very selective and subjective manner. The subject ‘Magda’ states in the Polish article: “I have a big problem with being unemployed, I don’t want to live at the State’s expense and for that reason I use this assistance to allow me start up my own business”. I believe that this is the sentence that best summarizes the context of the original article and it is decidedly unfortunate that it has been omitted in your article. In terms of her describing her life as ‘Hawaiian Massage’ , at no stage in this article does she make such a statement. What she actually says is that she has completed a FÁS course in Hawaiian Massage and that she’s planning to open a massage business next year. I think you can agree that this misrepresentation completely changes the tone of the article. She also never describes the place where she lives as s***hole (in fact she loves it and is very passionate about it), she merely refers to other people saying that. There are many other inaccuracies of that type throughout the Irish Independent article which could have been easily avoided if only the Polish article had been translated correctly or its content presented in a more objective manner. I fully understand how potentially damaging this article might be to the good reputation that the Polish community has amongst Irish society and I ask your readers not to judge us on the basis of this solitary article. You have managed to get to know us well in recent years and you know our work ethic and our system of values which, I’m sorry to say, is inaccurately presented in this article published in the Irish Independent. The decision to remain in Ireland that so many Polish people made in the recent years is a decision to make a valuable contribution to the Irish state by living and working here, integrating with the Irish society and being a part of it all in good times and bad. It’s impossible to imagine that this decision, sometimes a very painful one, is made on the basis of the level of unemployment benefit or other kinds of support granted to the jobless by the Irish State. Polish people that come to Ireland are young, well educated, dynamic and ambitious people who make a conscious choice to settle down here. Their first priority in life is to make an honest living for themselves. I cannot say that people like Magda don’t exist – they do in every society and community around the world, including the Polish community in Ireland. On the basis of my personal experience with so many Poles living here, I can assure you that people like Magda constitute a very small minority of Poles in Ireland, and are in no way representative of the entire Irish – based Polish community. The danger of an anti-immigrant atmosphere developing during harsh economic times is well-documented throughout history. I would hope that a major newspaper such as the Irish Independent would be conscious of this and take great care when fact-checking such a potentially inflammatory article. 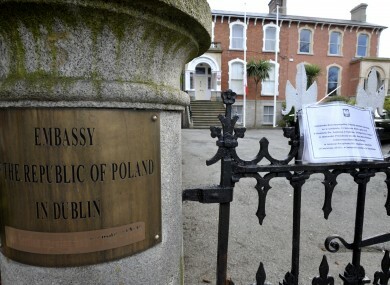 Email “Polish Ambassador responds to Irish Independent's 'Magda' dole article: Full text”. Feedback on “Polish Ambassador responds to Irish Independent's 'Magda' dole article: Full text”.